Sending packages home is how we manage to stay light, and usually it is not a problem. China, Vietnam and many other unexpected places make it a smooth, albeit paperwork laden, operation. 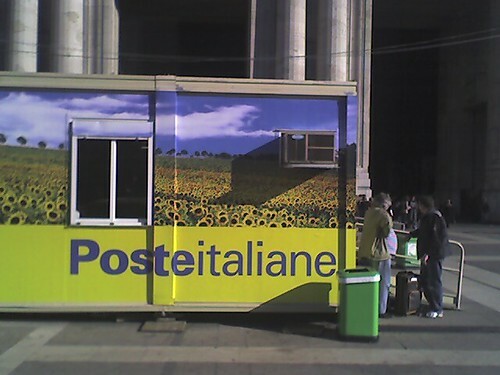 In Italy, where some things are so well designed and easy, the postal system seems to be a mess - at least for the traveler. 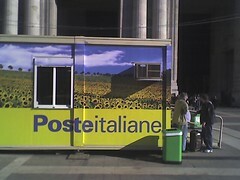 We needed to send home about 10 lbs of items and, as usual, found the post office near the train station in Milan. After waiting for 20 minutes, they could only sell us an oversized yellow box and the basic direction of another post office where we could send it. So, with our backpacks and a giant yellow box, we walked to the other station and waited again. It looked bad. There were 6 windows all blocked by glass - no place to pass over a big box. With a help of a very friendly Italian guy, we finally communicated that we wanted to send the box to America. At this point, she looked at us like we requested an express package to the moon. Neither post office was set up for sending packages - only items that could be slid under the glass sneeze guard. I wonder how Italians send a package? When she asked about the contents of our giant yellow box, my translator communicated that one item was pasta. She shook her head and had to look up if it was OK to send pasta to the US. I just wanted to say "We're in Italy right? Is pasta a protected item here? Is the US concerned about ecological effects foreign pasta? C'mon"
After a lot of talking in Italian, it became clear that our 10lbs of goods would cost USD 90 and about 500 dollars of pure hassle. Our translator left us with solace by saying that even for Italians, the post office is always an adventure. Fortunately for them though, they don't have to schlep around 10 extra pounds wherever they go when it doesn't work out. Maybe it'll be easier in France.